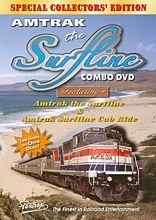 Amtrak, Southern Pacific and Union Pacific trains from Santa Barbara to San Luis Obispo are featured in this second part of the Coastliners video series. Much of the coast line is secluded within private ranches and Vandenberg AFB, and public access is limited to just Jalama Beach and Surf, but you will see the most interesting parts from the train and lineside, including scenes from the full length Amtrak dome car Ocean View. 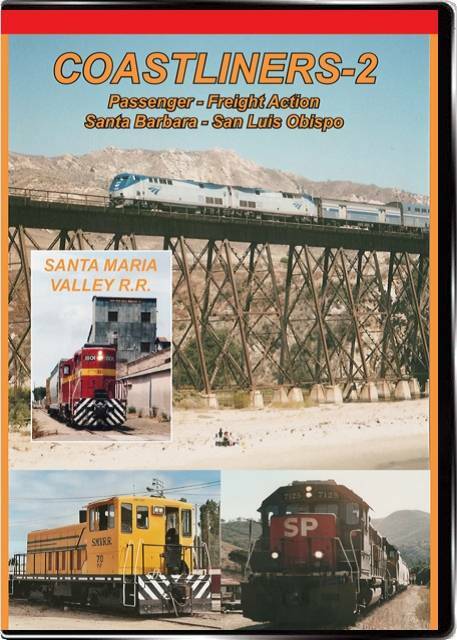 A special feature on the Santa Maria Valley RR shows current operations, including a ride on GP-9 No. 1801, historic film clips of 2-8-2 steam locomotive No. 21 operating in 1958, and a rare look at the Lompoc local operating to the Celite plant near Surf, and the last operating wig-wag on the coast line at Devon. 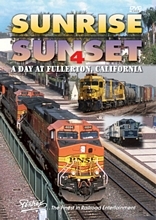 This program was taped over a period of 12 years, and shows many different variations of Amtrak motive power and markings. Digitally mastered in Hi-Fi stereo sound with narration. Running time: 86 minutes.